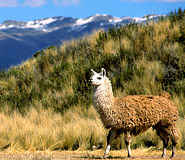 Discover La Paz during your price guaranteed Bolivia vacation. All of our Bolivia tours have daily departures and are fully customizable. Founded in 1548 by the Spanish colonizer Alonso de Mendoza, La Paz has been the stage for some of the most important moments in the history of Bolivia. The city has grown to become the second largest in the country and the center of industry, commerce, and finance. 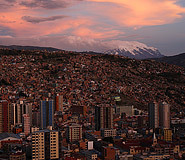 Although Sucre is Bolivia’s official constitutional capital, La Paz is the seat of the executive and administrative branches of government and functions as the “de facto” capital. Today, the modern city of La Paz has more than 2 million inhabitants, over half of whom can claim indigenous ancestry. Built into a canyon, the city’s altitude varies from 3,000 meters at the lowest elevations to more than 4,000 meters at the highest. The international airport is in the suburb of El Alto and sits at an elevation of 4,150 meters (13,615 feet). Vibrant and complex, La Paz is a fascinating mix of old and new stirred together into a frenzied bustle that will draw you in if you let it. In the city center you will find interesting places like the Artisan Market and the Witches' Market where you can buy medicinal herbs, potions, folk remedies, crafts, and trinkets. Other attractions include the central square called Plaza Murillo, surrounded by government buildings; and the church and monastery of San Francisco, built beginning in 1549. La Paz has many museums, including the National Folklore Museum, the Museum of Contemporary Art, and the Museum of Bolivian Andean Textiles. Finally, travel out of the city to Moon Valley, a desert-like landscape that stimulates the imagination and invites exploration. La Paz city tour. On a La Paz city tour, you may visit Plaza Murillo (the city's main square), the Presidential Palace, the National Congress, and the huge cathedral called Church of San Francisco. This church dates back to 1549 and is one of the finest examples of colonial religious architecture in South America. It is richly decorated with native religious themes. The markets on Sagarnaga Street are truly fascinating, selling sundry trinkets as well as llama fetuses and other unusual items for use in Aymara rituals intended to bring good luck and protect against evil spirits. You can find Inca artifacts at the Museo de Metales Preciosos (Museum of Precious Metals). Visit the Moon Valley. 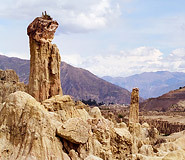 The Moon Valley is located right on the edge of La Paz. You can observe the amazing geological shapes of the “Valle de la Luna” from the Killi Killi watch tower in the south of the city. It is also possible to enter the valley itself to see the region’s spooky, lunar-like rock formations up close. Discover Tiwanaku. Tiwanaku, near the shores of Lake Titicaca, was the center of a powerful empire in the southern Central Andes. The roots of the Tiwanaku capital can be found in the village lying under the 1.5 square mile civic-ceremonial core. The city was settled by 400 B. C. on the Tiwanaku River, which empties into Lake Titicaca about 9 miles to the north. Between AD 100 and 1000, the small farming village evolved into a regal city of multi-terraced platform pyramids, courts, and urban areas, covering a total of 2.31 square miles. The Tiwanaku society was self-sustaining and its agriculture and fishing resource base was more than sufficient to support a complex administrative apparatus and large population of subjects. The Tiwanaku Empire collapsed between 1000 and 1100 A. D. Constructed to inspire awe, this magnificent royal city remains a superb site to visit. La Paz can be visited year-round. Expect rain in the summer months (December to March) and chilly night temperatures in the winter months (June to August). Peru For Less hooked us up with all the tools and plans to have an unforgettable experience. We toured Lake Titicaca, which was fascinating, especially the floating islands of Uros. The main part of Bolivia that I highly recommend is the Salt Flats of Uyuni. It's like being on another planet. We spent two days driving on and around the flats in a four runner with a guide and a driver. I couldn't recommend Peru For Less more if you're planning a trip to Peru or Bolivia. My grandsons and I had a great time with your company. Nancy made our visit to Tiauanaku wonderful. It was my second time with your company in La Paz and I would certainly recommend it to anyone. Thanks! Thanks a lot for making our first trip to South America a success. It was tiring once we got back home. But we enjoyed the whole experience very much. Dinner & Tango night in Buenos Aires was great. All the guides and drivers were very good. I must add that Nemicio in La Paz was outstanding. Hotel Europa is ideally situated to provide remarkable views of La Paz, which is itself overlooked by the majestic snow-capped Illimani Mountain. Centrally located in the heart of the city, this European-style hotel is indisputably the best business-oriented accommodation in town with high-tech in-room communication, fully equipped business centers, and outstanding leisure facilities that include a gym and a swimming pool. The exceptional services and facilities of El Rey Palace Hotel places it is among the best of La Paz hotels. Here, all rooms have bright red carpeting and dark wood furniture. The comfortable double rooms have two king-size beds and plenty of open space. The suites have separate sitting areas with velvety armchairs, and some also have Jacuzzis. The hotel is ideally located only 2 blocks from the lively Prado Street, yet stands on a quiet side street, making for a peaceful retreat in the heart of the city. This charming hotel is housed in a converted colonial mansion, and there's something in the air that just makes you feel comfortable. The hotel has grown and expanded over time, but the modern sections blend well with the classic architecture. There are two peaceful colonial-style courtyards that fill with Andean sunshine during the day and are ideal for whiling away a lazy afternoon. The rooms are cozy, with parquet floors and bright Andean-style bedspreads. Hotel Rosario is conveniently close to key attractions in La Paz, including the Witches’ Market and all the handicrafts stores on Sagarnaga Street.